Card stock, gesso, stamps, photo, magazine clippings, doodles from a ‘play day’. 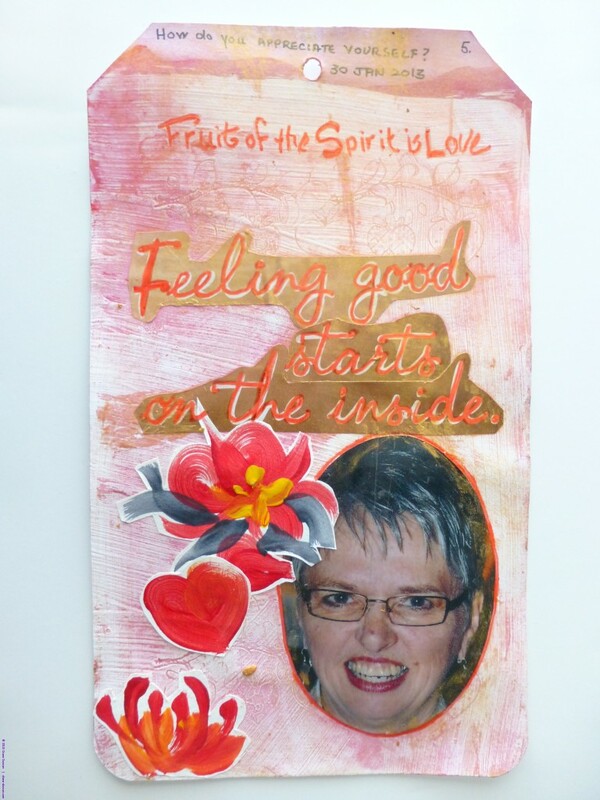 This is week 5 of a weekly art journal based on guides provided by Dale Anne Potter. All pages of this art journal are based on a tag created from card stock. This weeks challenge was How do you appreciate yourself? I started this week’s art journal tag by applying gesso and stamping it to create texture before it dried. I then used a wash of water colour to enhance the texture. I turned to my clipping file and found both a magazine headline and some brushwork samples that I thought would work with the background. I happened to have a photo of myself sitting on my desk awaiting an experiment for image transfer and when I determined that the ‘paper’ it was printed on was not water soluble I salvage ‘me head’ and gave this week’s tag the self focus it required. I found this week’s art journal topic hard to respond to. I am so oriented towards ‘on to the next project’ that I seldom stop to reflect on how far I have come. Building this website has forced me to do a look-back through my portfolios and it has made me realize how many steps there have been in this journey, how many aha moments, how often I have proceeded to tackle a new challenge with my knees shaking. Perhaps we should schedule a regular self-appreciation time into our busy lives to remind us that we’re ‘doing more than okay!